Reading is at the heart of our curriculum. It is essential that children are taught to read as early as possible. The timetable is based around teaching the children to read through whole class activities, small group work and 1:1 tuition. Phonics is introduced in Reception and consolidated in Year 1. The school uses the ‘Read Write Inc’ scheme developed by Ruth Miskin. Reading a range of structured books alongside real books encourages children to become readers for pleasure. Encouraging the children to express themselves clearly is another key aspect of our curriculum. Time is given on a daily basis to allow children to speak and listen, choosing words with precision and accuracy. We teach letter formation and cursive handwriting as children who feel confident with the secretarial skills of writing are less likely to be reluctant writers. A story-based curriculum encourages children to remember and reproduce a range of story plots in their own writing. 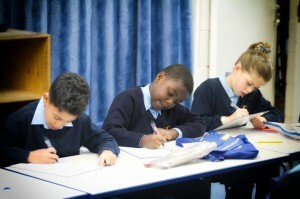 In Key Stage 2, children are taught to write in a range of genres. Grammar and spelling are taught every day, carefully woven into the Literacy teaching to ensure children understand their impact rather than just memorising a series of rules. In Mathematics, we focus on developing number skills and applying these in a range of real life contexts. A focus on learning number bonds and times tables is encouraged so that children can solve problems accurately and quickly. The core curriculum is based around teaching our pupils the basic skills required to access the rest of the curriculum. We respond to the needs of the children, allowing their strengths and weaknesses to guide our teaching plans.